Topics: How Merry Can Help You, Quiz, and Dog Listener. understandyourdog.com... Contact Form & Details Merry Dog Listener Merry Conway ..
Its 2 nameservers are ns1.salproserver.com, and ns2.salproserver.com. 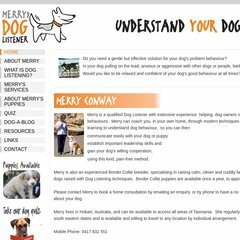 Understandyourdog.com.au's server IP number is 216.246.7.95. Hostforweb Inc (Illinois, Chicago) is the location of the Apache/2 server. PING (216.246.7.95) 56(84) bytes of data.